Last Friday, the Michigan House of Representatives Appropriations Subcommittee on Natural Resources approved a budget package which did include a hunting and angling license fee package which is generally consistent with that advanced by the Michigan Department of Natural Resources (MDNR) as a part of the Governor’s FY 2013-2014 budget proposal. For those who have been supporting the idea of strategic reinvestment in our natural resource programs, infrastructure and field personnel, that’s pretty much where the good news ends. In fact, by the time the subcommittee got done stripping out the Governor’s proposed General Fund support, the Great Lakes research vessel replacement, funding for the hiring and training of new Conservation Officers, and the $9.7 million allocation from the State Waterways Fund for dredging, the Subcommittee proposal results in a net reduction of $2.3 million from current budget levels (see Summary Report). This also represents a nearly $19 million reduction from the Governor’s original budget proposal. If that number sounds familiar, it is. This $19 million budget reduction is eerily similar to the $18.1 million in new revenue which had been projected as a result of the license fee restructuring. 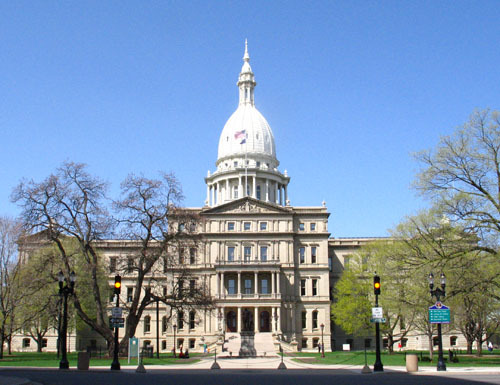 Although we don’t pretend to fully understand the Michigan legislative sausage-making process, we are told that there may be hope for some level of budget line-item restoration as a parallel effort gets started on the Senate side of the Capitol dome. Although we recognize that many following this issue have already called and emailed their respective State Representatives and Senators, we need to continue the effort by encouraging others to do likewise. The next two weeks of legislative recess are critical and during this time we cannot let others reshape the debate or mis-characterize the growing level of support which exists for the license fee package.